Because Terrible Labs loves you. 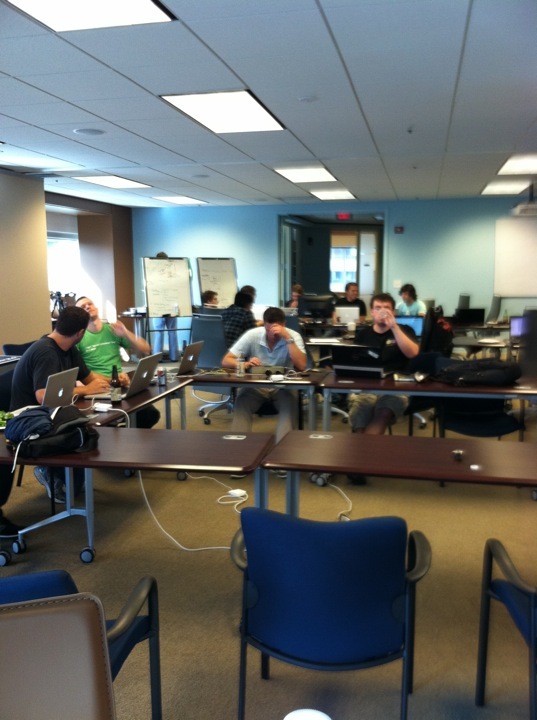 This past weekend we hosted the first APIs and IPAs event with RunKeeper. Before I get into the recap I just want to thank Winter Wyman and Silicon Valley Bank for sponsoring the day and Gemvara for letting us use their beautiful new office space to host the event. Also, congratulations to Greg Rublev for winning Winter Wyman’s $200 Amazon gift card! We had a solid turnout of developers who were interested in learning more about RunKeeper’s Health Graph API and building apps for the RunKeeper community. There was a large contingent of Ruby developers who banded together to focus on a couple different problems in the RunKeeper ecosystem. Joe Lind and Will Mernagh spent a majority of their efforts building RunKeeper’s Ruby Wrapper, Baby Tooth. Jeremy Weiskotten’s team focused on building an app (still needs a name) that leverages the game layer to help RunKeeper users raise money for charities by completing fitness challenges. And finally Jeffrey Chupp led a team working on an app that uses RunKeeper to track a user’s sleep. Check out the video from and Jeffrey, Joe and Jeremy’s presentations. Thanks to Arestia Rosenberg for filming and editing! We ended up running out of time to put the polish on all of these apps so we’ve decided to spend the rest of this quarter working with the Health Graph API. Every other Wednesday night at Gemvara (starting 9/21), we’ll be getting together from 6pm to 9pm to finish apps that have already been started and potentially create a few more. If you weren’t able to make it out on Sunday, feel free to sign up and swing by, we’d love to have you. Also, as this was our first foray into a hackathon style of event, we’d love to get the community’s feedback. Are you interested in learning more about local startups’ APIs and building apps on them? If you came to the event, what did you like, what didn’t you like? If you didn’t make it out we’d love to hear your 2 cents as well! Please leave us your thoughts in the comments! motion-juxtapose: Now With Rails Support!